After a rain last night then clearing around 2am on a very bright full moon I wasn't too excited about going to the lake. As I expected when I hung my lanterns there was not much difference in the lantern lights and the moonlight. I threw for about an hour before picking my crew up at 5:30 then threw for another hour and a half. My clients wanted to go out to watch the bait collection process and saw first hand how difficult it can be, even for a guide throwing a 10 foot net on 4 different lights. We ended up with about 75 baits which was plenty to start with. I told the guys with that bright moon we would be lucky to catch fish in the morning because every fish already ate on that full moon and especially since the major feed was at 5am. I set out a spread of 6 boards, a bobber and 8 downlines and started pulling shallow flats and points where I knew fish were holding. We took a couple of short hits which confirmed my thoughts on the non feeding mood of the Stripers. After leaving the shallows I started to move out to deeper flats when a few gulls started circling over the flat I just pulled. I saw a couple swirls under them so I turned back and pulled the flat again. That was a mistake, I went back to 8 inch punks chasing 2 inch Threadfin to the surface. 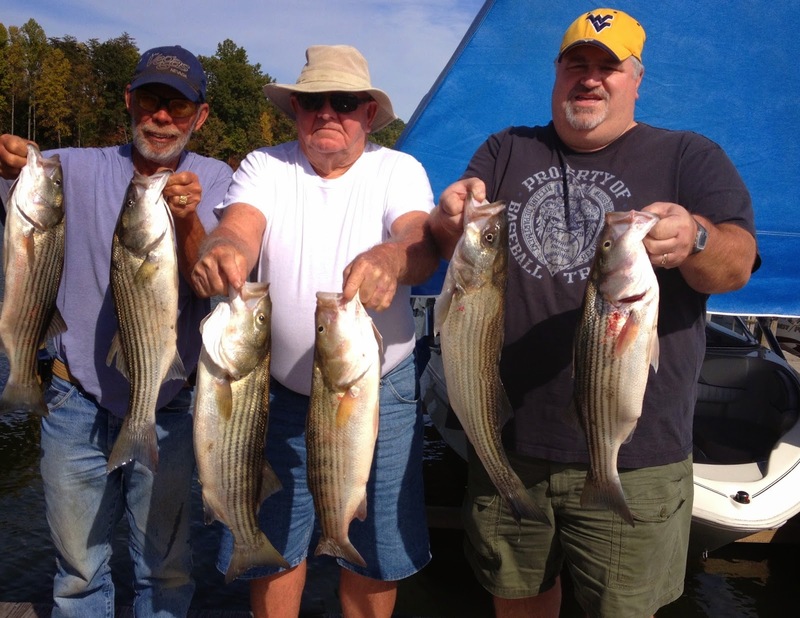 I moved to a ledge and we ended up catching 3 or 4 Stripers but took a dozen hits to boat them. The guys did not want to keep any fish but I kept a few for some people who had been asking me to save some fish for them. I worked a similar ledge and popped a few more then decided to go catch some larger Gizzards and try them. After catching them I set out my spread of 15 more lines and pulled about a two mile stretch of water only to catch a couple more fish. It was getting late and I told the guys I wanted to check out one more place. I went to an area where I catch fish in the middle of the day on a 30 yard section of a ledge. I set out downlines and before I could get 5 out 3 of them hooked up with nice Stripers. We boated them and many others till the bite simply quit. We had released fish in the area and I believe they warned the rest of the fish about our presence. My clients ended up being very happy with the trip and and want to come back and do it again, hopefully not on a full moon. They are holding a couple of the fish they caught today.